“A project like this has never been undertaken before..."
Wandering around the Las Vegas conference halls of The Venetian, host to a standout EMC World 2015, amidst the thousands of attendees racing from sessions to stands walked a legend, unassuming in nature but befitting of the true meaning of the word. No, it wasn’t EMC CEO Joe Tucci, VMware CEO Pat Gelsinger or Pivotal CEO Paul Martiz, or any representative of the EMC Federation for that matter. It was John McGuinness, an English professional motorcycle rider, who during 25 years of racing, has dominated the most prestigious race in the world, the Isle of Man TT races. Seen as the standout motorcycling race of the year, the race is held annually on the Isle of Man, a small island between the United Kingdom and Ireland in the Irish Sea. But with his presence seemingly unnoticed at such a huge vendor conference, McGuinness announced his arrival in style, steaming onto the stage at break-neck speed to unveil an almost uncanny working relationship with the tech giant. 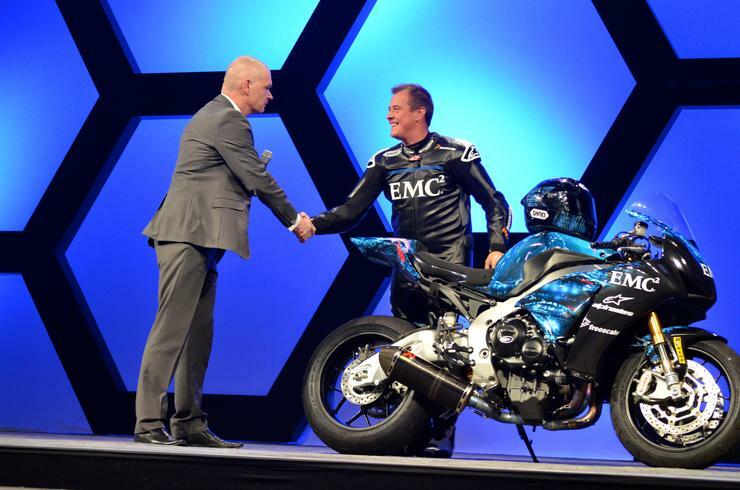 “We were really excited to see how big data can provide revealing new insights about someone like John McGuinness, and have been thrilled with the interest shown in this project from the data science and motorcycling communities around the world,” says Jonathan Martin, CMO, EMC. “A project like this has never been undertaken before, and is already proving some interesting and significant observations. “We are gaining a better understanding of what makes extreme athletes like John perform at such a superior level, but also through big data analytics we are gaining deep insights into how we can make the sport of motorcycle racing safer. As explained by Martin, EMC ran two competitions to help understand what makes McGuinness so fast - one focussed on data analytics and one on data visualisation. Sensors embedded in McGuinness’ suit and bike collected a vast amount of data at a Spanish test circuit in March 2015, which was released to the data science community to analyse and interpret. 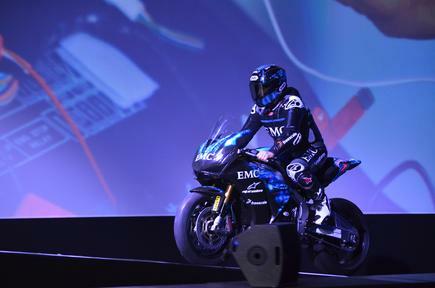 At the Circuit Monteblanco in Spain, EMC captured over 700,000 rows of performance, biometric and mechanical data from sensors fitted on the racing suits and bikes of both McGuinness and a control subject, Adam “Chad” Child, Senior Road Tester with Motor Cycle News. “I’ve been racing since I was 18 and I don’t really know why I’m so good at what I do,” says McGuinness, when speaking with Computerworld New Zealand in Las Vegas. “I thought it was interesting to see just how both the speed and positioning in the corners made the difference, from the test in Spain. The data sets from McGuinness and Chad were released to the data science community in the form of an open competition hosted on CrowdANALYTIX, and in catching back up McGuinness and his data experts five weeks later, the tech giant revealed the results of the data competition at the annual Isle of Man TT races in the United Kingdom on June 9. According to Martin and the EMC team, the competition provided a “broad range of insights” into McGuinness’ racing style, with the data insights helping the Englishman claim his 23rd career TT win, during a record-breaking week of racing in the UK. Another winner was Stefan Jol, a worker for a leading UK radio group, who claimed the top honours in the data analytics competition by splitting up each element of the track for analysis. According to Martin, this allowed them to be assessed and, like any business process, the data identified which stages had the most impact on overall performance. As a result a bike can be set up for the most important elements of the track, and the information can guide the rider on where best to focus. The winner of the visualisation piece, Charlotte Wickham, assistant Professor of Statistics at Oregon State University, made the relative performance of each rider more apparent to the non-data scientist. By displaying them on the track, the difference in cornering was made very clear. While one entered the corner faster, this didn’t equate to a fast exit. McGuinness braked harder, taking a better line, which in turn allowed him to accelerate quicker and exit at a faster speed. “Stefan was the only entrant who looked at how performance in one area of the track impacted performance in the other, which was ultimately why we awarded him the first place,” adds Mike Foley, Director, Data Science, EMC. “We wanted the community to think differently when approaching this challenge to draw out new insights into why John is so fast, and Stefan did just that. Read more Are Kiwi consumers at risk from outdated privacy law? The preliminary findings were so intriguing that EMC repeated the experiment with a more elaborate array of sensors at the Isle of Man TT, where they captured significantly more data which will be analysed to more definitively in the future. And with McGuinness smashing the absolute lap record on the second lap of the Senior TT race with a lap of 132.701mph, on his way to claiming outright victory, it appears that data, through the work of EMC, is an invaluable tool in the world of professional sport.